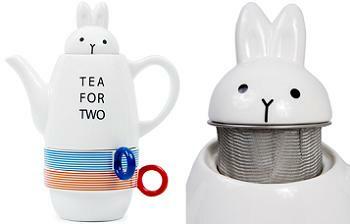 This Tea for 2 Set is a little silly, but extremely cute. It’s a bunny-topped teapot sitting atop two matching teacups. The bunny lid is actually a tea steeper, so there is some function to the form here. That said, I’m not going to trade in my regular strainers or teapots for this set. This is primarily because this set is a bit small for me. I actually think that this would make a great gift for a child, given the bunny peeking out of the top. It’s a chance to enjoy (i.e. be exposed to) some more interesting, loose-leaf teas and still have a whimsical tea party with mom, dad, grandma, or an imaginary friend.